While many parts of Ireland have been enjoying unseasonably mild weather this week, many parts of Greece have seen snow, including Athens, Crete, Thessaloniki and Mount Athos. Irish people traditionally associate Greece with a guarantee of summer sunshine when there is no guarantee of appropriate summer weather in Ireland. But one of my last front-page reports in The Irish Times before I left was a blanket of snow covering Athens while Ireland was enjoying an unseasonably mild winter. 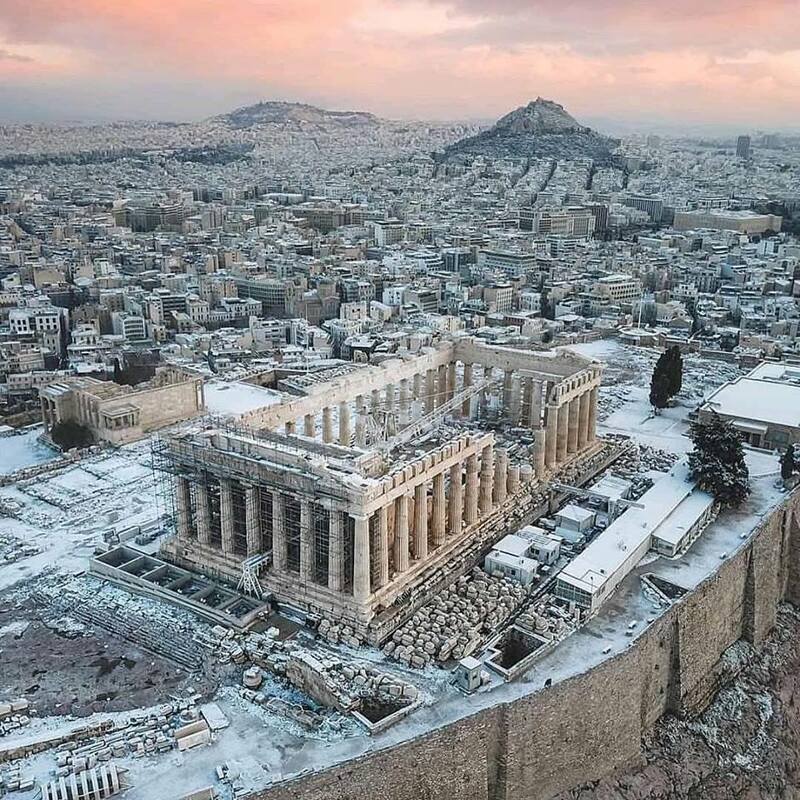 Snow is an unusual sight in Athens, but when it falls the sight the Greek capital covered in a blanket of snow can be breath-taking. Successive cold weather systems have swept into Greece, bringing freezing temperatures and snowfall to most parts of the country. And over the past week, a number of social media platforms have published photographs of snow throughout Greece. 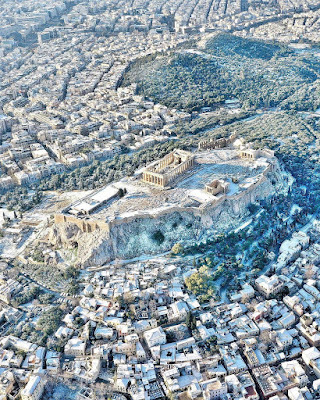 Many Greek photographers, including Marina Vernico, have captured some stunning images of the Acropolis and Athens from above this week. However, snowfall in Athens is not as rare as many would think. Between 1900 and 2012 , Athens has had a total of 500 days of snowfall, or an average of 4.5 days a year. Between 1900 and 1983, there were only four years without a single day of snow. In the 1984-2011 period, or over 28 years, there were five years without a single snowflake. Indeed, there were two years when Athens had snow in April, and in the same 110-year period there were six snowfalls during the Christmas season. During my annual visits to Rethymon, I have stayed occasionally at the Pepi Hotel on Tsouderon Street. 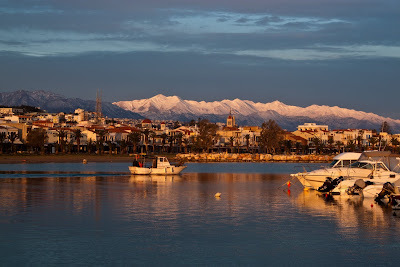 Earlier this week, Pepi Hotel published a number of photographs on its facebook page of snow on the mountains, providing a dramatic backdrop to the seafront in Rethymnon. 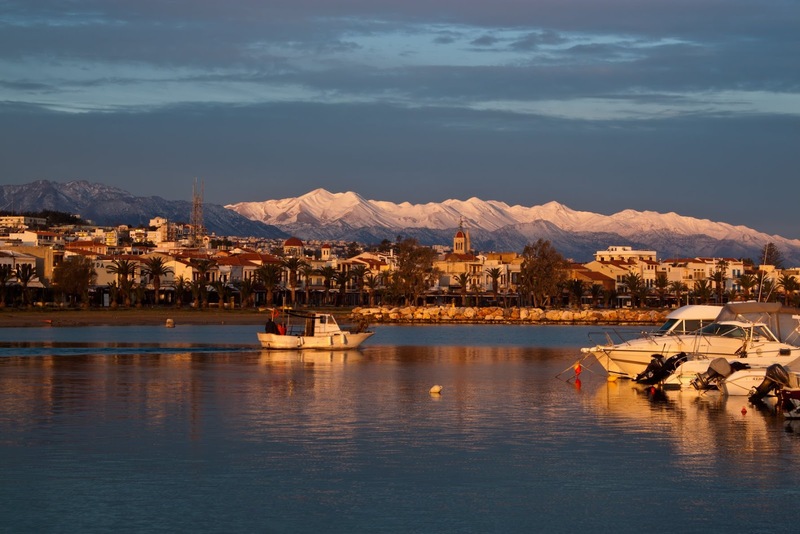 Other hotels have posted photographs on their Facebook pages of snow on the beach in Rethymnon and light dustings of snow on the squares and streets of the town. I have experienced Easter in Thessaloniki, but never been been there during Christmas or New Year. A new drone video, made on Tuesday morning by Artnoise Action, shows Thessaloniki, Greece’s second largest city, covered in snow. The White Tower, the landmark symbol of the northern capital, is surrounded appropriately by a pristine white blanket, turning the city into a winter wonderland. I have also been on Mount Athos for Easter, but have never been there for Christmas. Unlike the rest of Greece, the monasteries of Mount Athos follow the Julian Calendar rather than the Western or Gregorian. So the monks of Mount Athos celebrated Christmas Day on Monday [7 January] in what was truly a White Christmas. 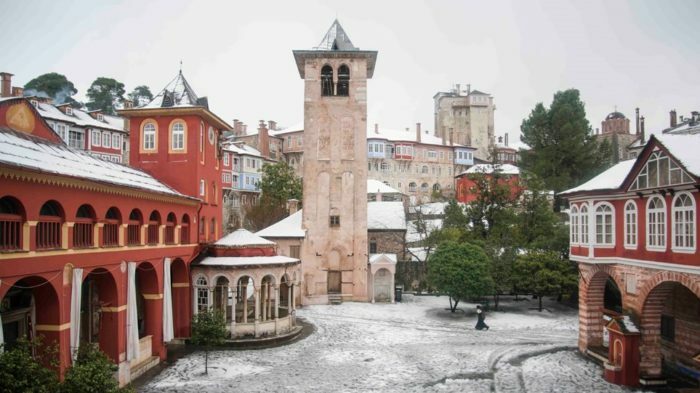 The consecutive snowstorms of the last few weeks created a Christmas atmosphere all across the peninsula of Mount Athos, with some of monasteries shrouded in snow exceeding one metre in depth. With these significant snowfalls on Mount Athos, Karyes, the Athonite capital at an altitude of 350 metres, received over 60 cm of snow, while higher areas were covered with more than 90 cm of snow. One report described the snow as bringing an atmosphere that was truly Byzantine to Mount Athos. An all-night Christmas vigil was on Sunday night and Monday morning in monasteries and monks and visitors alike were bathed in the golden glow of candles and chandeliers as snow fell outside. I have stayed in the past in Vatopedi, which is one of the oldest and most famous monasteries on the Holy Mountain. In passages of purple prose, one report said visitors and guests who had the privilege on being there this week ‘experienced true Byzantine mysticism and grandeur by participating in the overnight vigil’ in the early hours of Monday morning. 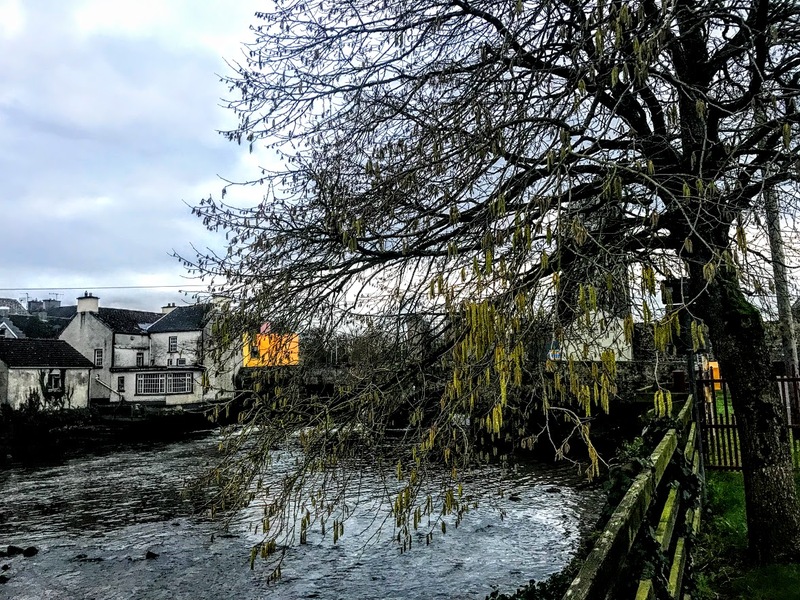 Daffodils are already beginning to show signs of promise in this part of West Limerick, and the evenings are beginning to lengthen. 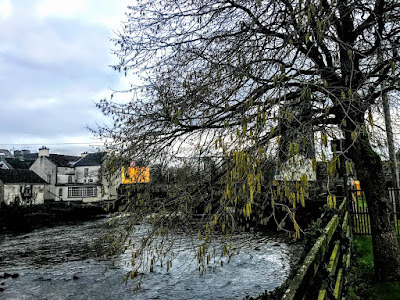 The mornings are still dark, and sunrise in Askeaton is not until 8:41 this morning [11 January 2019]. But sunset is at 16:43, which is more than eight hours of daylight today. Even after sunset, there is a brightness in the skies, and the birdsong intensifies at dusk, as if to hail the lengthening days with welcoming notes of joy. I may not get out for an early morning walk before sunrise this morning. But it was still bright when I went for a walk late yesterday afternoon by the banks of the River Deel, along past the swimming pool and the friary ruins and out to the bend on the river at Gurt where Desmond Rowing club will soon resume its evening activities and where the Deel flows out into the Shannon estuary. The brighter weather allowed brisk walks earlier this week on the beaches at Beale and Ballybunion in north Kerry, at the harbour in Foynes and by the River Maigue in Adare. Over the last few days, friends have been sending me photographs of heavy snow throughout Greece, including Crete, Athens, Thessaloniki and Mount Athos, so I am not being too complacent about the weather in this part of Ireland at the moment. Although I have planned visits within the next few weeks to Prague and Porto, and to Crete for Greek Easter at the end of April, I recall all too easily how the ‘Beast from the East’ put a stop to my plans to visit Warsaw last year. Lent and Easter are late this year, with Ash Wednesday on 6 March and Easter Day on Easter Day on 21 April in the West and on 28 April in the East. 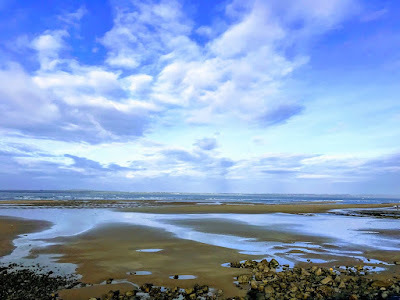 But there is still a hint of Spring in the air, and while there is there is a spring in my step and I am enjoying the opportunities the lengthening days present for my walks by the rivers and beaches of west Limerick and north Kerry.